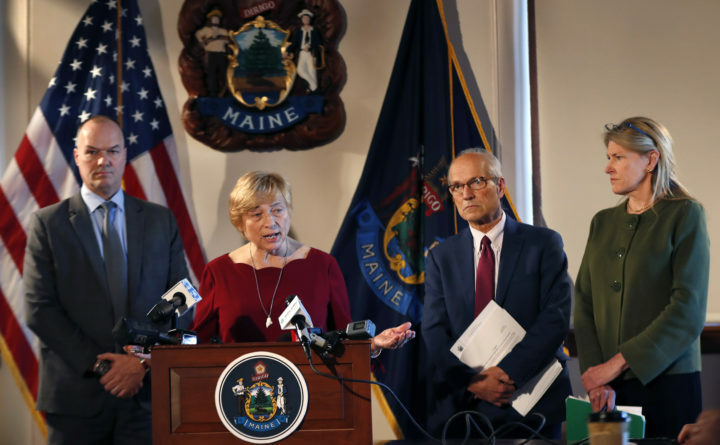 Governor Janet Mills speaks at a news conference in the State House, Wednesday, Feb. 6, 2019, in Augusta, Maine. On Wednesday, Gov. Janet Mills issued an executive order to increase access to medication-assisted treatment (MAT) in our jails and prisons. This comes as a welcome step toward a smarter, more effective approach to Maine’s opioid crisis. In fact, it is something we have been fighting for in the courts for years. Medication-assisted treatment uses FDA-approved medications to reduce withdrawal risks such as excruciating pain and increased risk of overdose. When administered properly, these medications carry a low risk of misuse while allowing patients to stop depending on heroin or other opioids. Despite the medical consensus that MAT is safe and effective in combating substance use disorder, the Maine Department of Corrections and most Maine jails have had a policy explicitly prohibiting this treatment for incarcerated people. By denying adequate medical care to people in state custody, these policies not only ignore common sense but violate the Eighth Amendment to the U.S. Constitution, which prohibits cruel and unusual punishment. They also violate the Americans with Disabilities Act, which protects people with substance use disorders who are in treatment. We have made those arguments in an ongoing lawsuit on behalf of a Maine woman who stands to lose access to her medication when she enters the Aroostook County Jail to serve a 40-day sentence for theft. In September, we settled a similar case, which resulted in our client being able to take his medication while in jail. So, we are heartened that Mills and Corrections Commissioner Randall Liberty have announced their own plans to reverse this harmful policy and create medication-assisted treatment programs in Maine’s correctional facilities — whether the court forces them to do so or not. Liberty, who has served as warden of the Maine State Prison since 2015 and was a sheriff before that, asserts that a medication-assisted treatment program will reduce the illicit drug trade within correctional facilities, and leave incarcerated people better equipped to re-enter society. Medical experts, the National Sheriffs’ Association, and President Donald Trump’s bipartisan Commission on Combating Drug Addiction and the Opioid Crisis agree. The Mills administration’s policy change recognizes that denying needed medication to people with opioid use disorders serves absolutely no good purpose. Withholding needed medication undermines the important goal of keeping people off of opiates, increases their chances of relapsing after getting out of jail, and makes us all less safe. After all, if one of the goals of our criminal justice system is to increase public safety, and most people who spend time in the system eventually re-enter public life, shouldn’t we do what we can to help people succeed upon release? We know that the criminal justice system can’t solve the opioid crisis, but the least it can do is not make matters worse. Yet that is exactly what happens when we deny incarcerated people the doctor-prescribed medicine that helps keep them in recovery. The governor’s plans will help right this wrong. We hope other states will follow suit. Zachary Heiden is legal director for the ACLU of Maine.